Lewis Hamilton boosted his chances of extending his world championship lead at Sunday's Japanese Grand Prix by taking pole position in Fuji. The McLaren driver produced a late flying lap of one minute 18.404 seconds to claim his sixth pole of the season. But Ferrari rival Felipe Massa, who trails Hamilton by seven points in the title race, endured a disastrous qualifying finishing back in fifth. Kimi Raikkonen was second for Ferrari ahead of McLaren's Heikki Kovalainen. Also starting ahead of Massa on the grid is Fernando Alonso, a surprise winner for Renault last time out in Singapore, as he continued his run of good form to qualify in fourth. BMW Sauber's Robert Kubica posted the sixth fastest time ahead of Toyota duo Jarno Trulli and Timo Glock. The Toro Rossos of Sebastian Vettel and Sebastien Bourdais completed the top 10. "I'm very happy," said Hamilton, who is three races away from a maiden world title. "The team have done a phenomenal job. "It was pretty straightforward. The last lap I put all the sectors together and I was able to bring it home. "We will push forward with the strategy on Sunday. It's going to be a tough race because Kimi is right there but we will take as many points as we can." 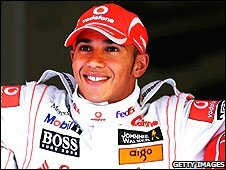 McLaren team boss Ron Dennis described Hamilton's 12th career pole as the "best of his life" adding it came at a "critical time". With both the drivers' and constructors' titles at stake, the Woking-based team is determined to adopt a cautious approach to the title run-in especially after the calamitous close to the 2007 season. After claiming victory at last year's Japanese Grand Prix, Hamilton held a 12-point lead in the title race only to surrender the title to Raikkonen, who at that stage was 17 points adrift. When asked if he would allow Hamilton to race for victory in Fuji, Dennis said: "We don't want to pass over any victories that might come our way, but who knows?" Massa's hopes of victory in Japan took a knock after he failed to find his true pace over his final hot lap at the Fuji Speedway. With the track drying out well after a damp final practice, Massa had topped the standings in the second qualifying session and looked strong going into the decisive third spell. But his Ferrari lost performance when it counted and the Brazilian suggested a heavier fuel load could be to blame. "The car was great to start with but in Q3 I just did not have the grip," said Massa, who is also vying for a maiden world title. "It may have been down to the fuel load, but we shall have to see. It won't be easy in the race, but we will do our best." Raikkonen can still mathematically defend his world championship crown but, despite sharing the front row with Hamilton, he stressed he is focused on picking up points for Ferrari. "I think it a small chance but I try to win races," he said. "We want to win the championship as a team and we will see what we can do. "If we can win it would be nice but if not we will try to get maximum points." Toyota delivered in front of their home fans at a track the company bought eight years ago with Trulli seventh ahead of Glock, who topped the timesheets in the first session of qualifying. But Honda failed to deliver on home turf as both Rubens Barrichello and Jenson Button failed to get beyond the opening spell when BMW Sauber's Nick Heidfeld was also surprisingly eliminated. Renault's Nelson Piquet starts in 12th after aborting his qualifying attempt during the second session. Renault claimed the Brazilian had been blocked by Hamilton but their complaints went no further.